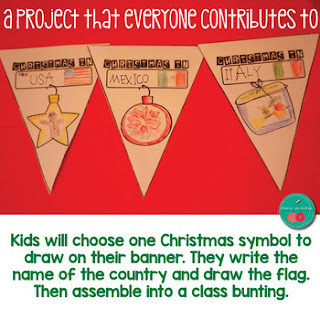 This is an easy to set up and use Christmas Around the World Craft. Print as many as you need from the design you like best. Assign a country to each kid or they can choose one they like. I plan to ask each kid to make a banner for a different country and as the countries we discuss will not be enough, some of the kids will have to do their own research. There are always volunteers for such tasks. They love to prove they can do it on their own. When everyone's ready assemble into a bunting to decorate your classroom. You may also like these BLOG POST. I collect the links to VIDEOS, BOOKS, GAMES, and more we use in our Christmas Around the World unit at home.